Hydrogen Energy can be used as alternative to the fossil fuel and many scientists around the world feel that hydrogen as a source of energy could be a permanent solution to the global crisis we are facing in our energy supplies. 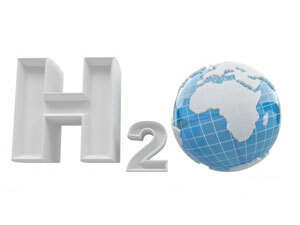 As Hydrogen (H2) gas can be produced from water, it is therefore one of the lightest, most efficient, cost effective and cleanest fuel on the planet and as such has the great potential of being one of our primary fuels for powering our vehicles for a cleaner, greener future. Hydrogen is the simplest and most abundant element on Earth as a hydrogen atom consists of only one proton and one electron making it the first element in the periodic table. But despite its simplicity and abundance, hydrogen does not occur naturally as a gas here on the Earth instead it is always combined with other elements. For example, water as H2O. This is handy since over 72% of our planet is covered with water making the production of hydrogen as a source of energy highly sustainable. Hydrogen also exists in nature in many organic and living organisms in the form of hydrocarbons which make up many all of our current energy fuels, such as natural gas, gasoline, propane and methane. In its pure form, hydrogen is colourless and odourless, but highly flammable gas acting as an energy carrier, not an energy source. Hydrogen is not a primary energy source which can be easily mined like coal, oil or gas. Instead, hydrogen is classed as a secondary energy source in a similar way to that of electricity which must be generated first by using energy from another source, either using photovoltaics or fossil fuels. We all learnt in our science classes at school that water is a combination of two atoms of hydrogen and one of oxygen (H2O). Because water is so common, most methods to produce hydrogen gas focuses on extracting it from water using Electrolysis. Electrolysis separates the hydrogen molecules from the oxygen molecules in water using electricity. We can also separate them using sunlight instead of electricity and this process is called “Photolysis”. You may think that using fossil fuel generated electricity to produce hydrogen somewhat defeats the object, but as the electrical energy required to separate the water is small, we can also use photovoltaic cells powered by the sun to generate enough electricity to produce hydrogen. This process is called “Photo-electrolysis”. Clearly to achieve the benefits of a truly sustainable hydrogen energy supply providing energy to the world, we need to produce large quantities of hydrogen by the process of electrolysis using non-fossil resources, such as water, and ideally using electricity derived from renewable energy sources, for example, photovoltaics, wind turbines, hydroelectricity, etc. Then this ideal scenario of producing sustainable hydrogen energy from the sun by splitting water from our oceans creates a whole new renewable energy term and expression: “Solar Hydrogen”. Electrolysis is the process by which an electric current is passed through water and breaks the chemical bonds that exist between the hydrogen and oxygen atoms. The equipment used for doing this is called an “electrolyser”. An electrolyser basically consists of a positive element called the Anode (A), a negative element called the Cathode (K), both immersed in a liquid called an electrolyte which can carry a current. When an electrical voltage supply is connected to the two electrodes, an electrical current is passed through the conducting electrolyte causing electrons to flow from the anode (where oxidation occurs) to the cathode (where reduction occurs) breaking down the water into its constituent elements, of hydrogen and oxygen. A separator type membrane is used to separate the hydrogen’s protons and electrons. In most cases water electrolysis is used to produce the hydrogen, but the electrolyte can also be a solution of water and acids or metal salts. The electrical current also breaks the molecular bonds between the atoms and once broken, the atomic particles (hydrogen and oxygen) become either positively or negatively charged and are free to move through the electrolyte. As the two electrodes are also positively and negatively charged from the battery supply, this attracts the free atoms towards them with the hydrogen atoms being attracted to the negative electrode forming bubbles of hydrogen gas. Generally, the positive hydrogen atoms gather at the anode (which is negative), while the negative oxygen ions reside at the cathode (which is positive). When the hydrogen and oxygen gases formed at either terminal and large enough they break free and rise to the surface were the hydrogen gas is collected and the oxygen gas is vented. Then we can see that electrolysis is a method of producing chemical energy (hydrogen and oxygen) by passing an electric current through a chemical substance called a watery electrolyte. Once the hydrogen has been collected and purified, we can then use hydrogen as a fuel in a number of different ways as it has a wider range of flammability limits and a lower ignition energy than many other fuels. Also being used mainly as an industrial gas, the technologies need for the production, storage, and transmission of hydrogen are well established in the chemical industries. Unlike petrol or alcohol based fuels, which are easily handled liquids at ambient pressures and room temperatures, hydrogen is a lightweight gas at normal ambient temperatures. But the advantage of hydrogen as a fuel is that hydrogen can be converted into a liquid at low temperature, around -253oC and delivered as a liquid by road or rail, or compressed to a high pressure and delivered by gas pipelines. However, the liquefying of hydrogen still remains very energy intensive despite decades of industrial experience. Having seen how hydrogen energy is produced using electrolysis, one application of using hydrogen as a fuel source is in conjunction with a hydrogen fuel cell. A fuel cell is a device for converting the chemical energy of a fuel, in this case hydrogen, into electrical energy which can be used to power homes, schools or our cars. Fuel cells can operate using a wide range of fuels, not just hydrogen, and are seen by many as a clean, high-efficiency power source. Fuel cells operate by mixing hydrogen (the fuel) with oxygen (the oxidant) to produce electricity and water (as a by-product). Then a fuel cell works on the principle of electrochemical combustion by recombining the two atoms to produce an exothermic reaction of light and heat. This offers the opportunity for highly efficient conversion of hydrogen and an oxidant (usually air which contains oxygen) into electrical energy as the hydrogen fuel can be stored as a chemical fuel and converted into electrical energy when needed. The only by-product is water as the hydrogen and oxygen atoms recombine. But what’s the difference between a fuel cell and a battery. While both the battery and the fuel cell are electrochemical devices that are capable of converting chemical energy into electrical energy, the chemical reaction within the battery releases free electrons that travel between the two terminals and out to the load as electricity. But more importantly, batteries are expenses and the electricity being consumed by the connected load is constantly using up the batteries stored energy. This is because a battery is a sealed energy storage system and once the energy is used, the battery needs to be recharged or replaced giving it a relatively short life span. The hydrogen fuel cell on the other hand, is more like an energy converter than the energy storage device of a battery. The chemical reaction of a fuel cell converts the hydrogen fuel and oxygen into electricity producing water as a by-product. Then a fuel cell will continue to provide power as long as it is supplied with the hydrogen fuel and as such does not require recharging or replacing like a battery. The advantage is that a fuel cell can be refilled with hydrogen just the same as filling an automotive vehicle with diesel or petrol. But a single hydrogen fuel cell is not enough to power a vehicle so many are combined or stacked together to increase the output voltage potential in a similar way to connecting batteries together. The voltage required to power a small vehicle can be a few hundred volts to many kilovolts (kV) depending upon the range and speed. There are many good advantages to hydrogen fuel cells with the main ones being that they are very easy to make, contain no moving parts, so are quiet, and require very little maintenance, unlike conventional batteries. Hydrogen fuel cells are also light and versatile. Fuel cells can be manufactured big or small and used on a large or small scale to provide green energy for a home or to power a car and being modular in design, you can use just one on its own or connect many together for increased power outputs just like batteries. Hydrogen Energy is free energy from the sun as we can use photovoltaics (the creation of electricity using solar cells) to release energy using the chemistry of water. Water molecules consist of one oxygen atom bound to two hydrogen atoms (H2O) and by releasing these atoms (using electricity) we can create hydrogen gas to be used as part of a solar energy storage system. The main uses of hydrogen energy until now has been as an industrial chemical, fertiliser or for use within the space industry, where we have seen on the TV that its combustion with pure oxygen provides the propulsion for the rocket stages, which again shows how much energy can be stored in a hydrogen system. But as well as rocket engines, many much smaller hydrogen energy systems and uses are now being developed, including hydrogen powered “zero emission vehicles” (such as those produced by Honda and Toyota) which use either a modified internal combustion engine or multiple fuel cells with hydrogen energy as a fuel. Unfortunately today, most of the hydrogen gas consumed in the world is generated from fossil fuels and especially natural gas through a process called steam reforming. To make hydrogen energy using steam reforming, the natural gas is reacted with pressurised steam at a very high temperature in an enclosed combustion chamber. A metal catalyst is used to help break down the natural gas releasing methane which is then mixed with water to produce hydrogen. This reaction also creates carbon oxides such as carbon monoxide and carbon dioxide as a by-product which can damage the environment if released. But large-scale production of hydrogen by electrolysis using renewable energy sources such as solar photovoltaic energy, hydro power, hydroelectric power, or even nuclear power to create the electrical currents required to separate the molecules, then the process of producing hydrogen energy by electrolysis would become much more affordable. Also, other sources of green energy could be obtained through the use of biomass: waste, sewage, and agricultural residue are all endlessly renewable and have little negative effect on the environment. In addition to transportation, hydrogen energy can also be used effectively in producing heat, power, or a combination of the two. The problem is that as the cost of producing hydrogen on a large scale is still relatively high so is unlikely to be used as a fuel simply for heating our homes. There are other types of petroleum based fossil fuels more effective for this purpose. However, hydrogen energy technology is constantly evolving and has the potential to offer significant advantages over conventional fuels in terms of low or zero emissions and with the possible integration of hydrogen energy storage with renewable energy sources, it offers the possibility of economically efficient remote power systems and reductions in the external costs of energy associated with many fossil fuels. To learn more about “Hydrogen Energy”, or if you just want to explore the advantages and disadvantages of using hydrogen as a fuel, then Click Here to get your copy of one of the top books on hydrogen energy and fuel cells direct from Amazon today and learn how hydrogen and hydrogen fuel cells can give us the prospect of a cleaner planet. Interesting article, but is hydrogen really that non-polluting and green. True that a cars fuel cell only produces water and heat as a by-product from its exhaust, but the processes of creating the hydrogen in the first place is not as clean. The electrolysis process for extracting the hydrogen gas uses lots of electricity supplied from coal and oil burning power plants that are highly polluting. Also your comments of extracting hydrogen from natural gas also produces carbon emissions which is exactly what we are trying to avoid in the first place by using hydrogen as a transportation fuel. Hello Roger, Compared to conventional fossil fuel powered vehicles, hydrogen fuel cells are exceptionally clean, efficient and almost endlessly rechargeable. The problem is that to create hydrogen you have to take it from clean water that requires additional energy to break the bonds. Then in the end hydrogen isn’t an energy source just an energy storage system which can be used to power vehicles. If you got your electricity from a PV cell or a windmill at night, you produce free hydrogen what is the problem? The problem is all the fossil fuels that went into creating PV cells or windmills. Given the vast amount of oil and coal that go into mining, refining, processing, transporting the materials that go into PV + Windmills; processes which, by the way, can not be accomplished other than with oil and coal– the fossil fuel industry is mostly amused and not the slightest bit threatened by PV + wind. There is no carbon-free energy anywhere. Making Hydrogen from any energy source is criminally inefficient, energy-wise. If you got your electricity from a PV cell or windmill…. just charge a battery. Hydrogen is an intermediate step which is totally unnecessary.